Graduation has come and gone. If you’re like so many young people today who were unable to secure professional employment in the field of their choice before leaving college, you’re likely still hunting for those ideal job postings, submitting applications, and going on as many interviews as possible. Resume in order? Check. Networking events attended? Check. Social media accounts cleaned up? Hmm. If you haven’t done so already, you might want to seriously rethink what you’ve put out into the social media universe as well. This, believe it or not, is a critical part of the job search. 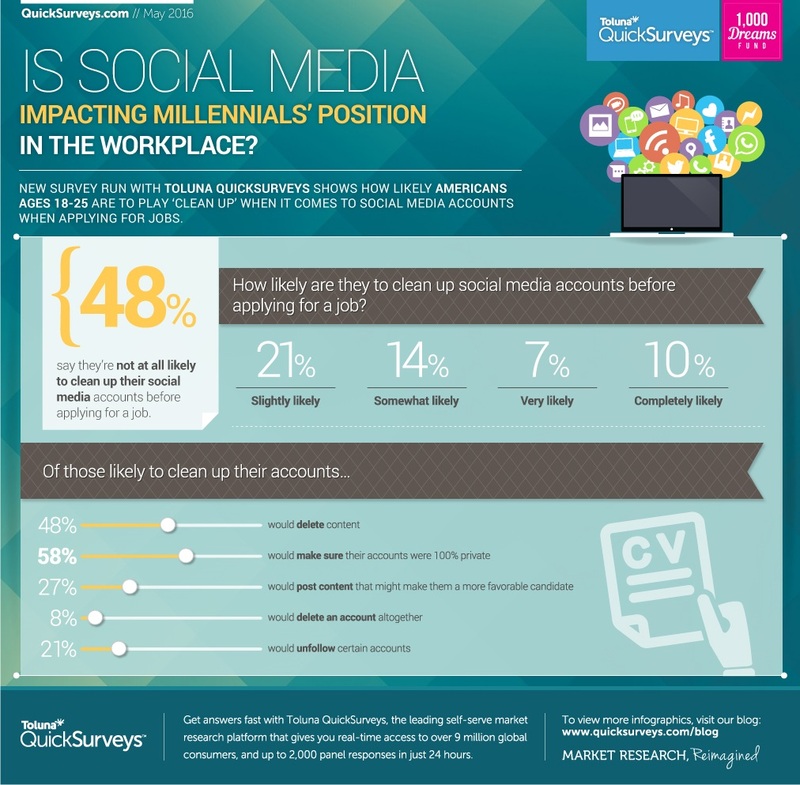 A recent survey conducted by my nonprofit, the 1,000 Dreams Fund, via Toluna Quicksurveys found that half of job seekers polled between the ages of 18 and 25 don’t plan to clean up their social media profiles before applying for jobs. This is a big mistake, especially given that employers say they use social media to screen and possibly eliminate candidates, according to another recent survey. The bottom line is this: Don’t let some social media goof overpower your stellar application and prevent you from becoming the next promising employee at the company of your dreams! Here are five tried-and-true tips from other successful grads about cleaning up your social media profile during the all-important job hunt! Search yourself to see what comes up. Be sure to dig deep and see what each page contains. What you see may surprise you – and it’s the quickest way for you to gauge what employers are seeing. Depending on what you find during your Google search, it may be a good idea to make your Facebook profile private so that only those in your network of friends can see all the fun you had in school. Your employer can access pretty much anything online. If you wouldn’t want them to see a specific post, tweet, or picture, delete it. If you find something on a third-party site you don’t want out there, reach out to the publisher or editor to see if they’ll remove the post. In most cases, they will, especially if you are clear that it could impact your ability to find a job. Getting ready to post an update, or maybe a pic from that girls’ night out? If it’s something you wouldn’t want your teenage cousin or grandmother to see, you should probably reconsider! At the end of the day, there’s no way to gauge who is looking at your pictures or posts, so you should be sure to avoid posting anything controversial. Cleaning up your social media presence can be a time-consuming process, so it’s important to know that there are professional “scrubbing” services you can lean on. These services are especially useful when you’re dealing with something that’s hard to remove, because they pride themselves on cleaning up messy digital footprints. Christie Garton is an award-winning social entrepreneur, author, and creator of the 1,000 Dreams Fund. By Tom Brodbeck and originally posted on SocialMediaToday. Facebook has lots of different features available on their business pages for business owners. So many that they can be overwhelming and confusing. Just in the past few months, Facebook rolled out some new updates that you may not know about and you can use them to add more spice and some character to your business Facebook page. Here are a few of the common features that I like to utilize when I am setting up a Facebook business page. Back in March, Facebook changed their user guidelines about what text can be added to cover photos. The previous restrictions allowed text but businesses were not allowed to put their address, website or other calls to action. Now, those restrictions have been lifted but the text of your cover photo cannot be more than 20% of the image. It can be confusing to measure the 20% restriction, so Facebook has a tool to help you determine if your cover photo meets the new guidelines. Another tool you could use is this one by Paavo. Just put in your Facebook username and then a grid will overlay on your photo to see if you pass the 20% test. Take advantage of the loosened restrictions by adding your website, or advertise for an upcoming event! Need some ideas? Here is a great post highlighting businesses that are already taking advantage of the new rules. To add a little personality to your Facebook page, try adding featured page owners. The featured page owners will appear next to your business information when people click on the “About” link below your profile photo. This is especially nice if you are a small business and gives people more of a personal feel. If you would like to add a featured page owner, in the admin panel of your business Facebook page, click “Edit Page” then “Update Public Info” and then “Featured” which is on the left side, and then “Edit Featured Page Owners.” There you can choose which administrators you would like to have featured. In the same section as the featured page owners, you can also feature likes of other businesses. This would be a great place to add some of the businesses you work with or a place to highlight clients. To add a featured like, you must sign in using the business page by clicking on “Edit Page” and then choose the “Use Facebook as …” option. Then go to the pages you’d like to feature and like their page. Next, go back to the admin panel, click on “Edit Page”, then “Update Public Info” and then choose “Featured”, which is on the left side. Above the Featured Page Owners is where you can choose which pages you would like to highlight. Facebook as also recently rolled out a new “reply” feature for business pages that will allow you to reply directly to comments left on posts and start a conversation thread. But to utilize the feature, you have to go into your admin panel and activate it. To activate it, click on “Edit Page” in the admin panel and then click on “Edit Settings.” One of the last items on the page says “Allow replies to comments on my Page.” Click the check box next to this option and save your changes. By Genia Stevens and first published on business2community.com. Most marketers already understand that the biggest benefit to adding social media to their marketing strategy is that a brand can join its customers where they meet and exchange information. One billion people are talking to each other on Facebook. They’re discussing everything from the movie they saw last night to the horrible customer service person they just dealt with on the phone. Brands can sit back and let their customers control conversations related to their product or service – or they can join the discussion and become an active participant in the shaping of their brand’s image. If you’re a marketer who hasn’t implemented a social media strategy (yes, they do exist), the first thing you’ll want to do is develop a written strategy. By developing a strategy, you’ll avoid common pitfalls down the road. This seems like an easy task, but you’d be surprised how many new business owners don’t know who their target market is. Spend time giving this some serious thought. If you already know your target market, think about additional markets you can tap into. For example: You currently sell women’s shoes. Have you ever thought about developing a specific strategy that targets African American women? Once you’ve determined your target market, do you know which social networks they use? Establish a strategy for approaching your target market without coming off as a pushy salesperson. Do you really understand what your organization does? Do you understand how your organization’s product or service benefits the consumer? I’ve trained a lot of marketers at the senior level who didn’t comprehend the full scope of their organization’s products and services. A marketer can’t successfully promote something he doesn’t understand. There’s a reason you decided to use social media as part of your marketing strategy: what is it? Are you trying to launch a new product? Are you trying to increase sales? Are you trying to build brand awareness? Whatever it is that you’re trying to accomplish, set specific and measurable goals that will help you determine the success of your social media campaign. 4. Who will create, implement and manage your campaign? Some organizations are large enough to afford a social media team that consists of marketing professionals on all levels. The executive level person develops the strategy, the senior manager implements the strategy and the entry-level person manages the day-to-day tasks of posting updates and responding to community members. Some organizations outsource one, or all, of these tasks to a third party. Regardless of who you choose, those people (or that third party) must have extensive knowledge of social media and must be passionate about building and maintaining relationships. 5. What tools will you use? There are hundreds of social media tools on the market – many of which are free to use. Some of the tools you might want to consider using are blogs, your own website, video sharing websites, social media press releases, content management and tracking tools, apps developed for your smart phone or tablet, and content curation tools. 6. Where will your content come from? The one concern I hear often from business owners struggling with their social media campaign is “I sit at my computer and try to figure out what to post on my business page, but I always draw a blank.” The main reason these business owners sit staring at a blank screen is because they didn’t establish a social media strategy before they added social media to their marketing strategy. If they had, deciding what to post on their business page would be simple. I always advise business owners and marketers to establish a content marketing strategy as an addendum to their social media strategy. This content strategy will include a plan for developing content and it will include a content calendar. Your content should be a good mix of your own content (blogs, pictures, videos, promotional items) and other people’s content (OPC). Before you post any content, you should always ask yourself: will my community find this content useful, informative or entertaining? 7. What milestones will you establish? Establish time-frames for accomplishing short-term (3 – 6 months) and long-term (1 year) goals. Consider timing your milestones with product launches or major corporate initiatives. 8. How will you measure your progress? Measuring your progress is extremely important, especially since you probably have a boss you have to answer to. Besides having a boss who will want to know exactly how the company’s social media strategy is progressing, you’ll want to know your progress so you can build on the activities that are working well and discard any tasks that are wasting time and money. Use Bit.ly or a similar URL shortener to track clicks on links you’ve posted on your social networks. Tracking tools, like Bit.ly, will help you track how often your content is shared and these tools will help you monitor the level of engagement with your content. You’ll also want to track any leads generated by your social media activity. And of course, you’ll want to track any revenue related to your social media activity. Tracking other conversions, like the growth of your e-newsletter, will provide you with a clear picture of the success (or failure) of your social media strategy. 9. How will you manage your brand’s reputation? Assign a person to assume the responsibility of monitoring the social media sphere for mentions of your company’s name. That person should also watch for mentions of any key executives at your organization. There are dozens of social monitoring tools that will help you stay alert. If a problem arises, your brand manager should put out that fire quickly. She should respond to questions, comments and complaints from your social community. Brands that take the time to write a solid social media strategy will develop a great relationship with their social community. Those brands will also avoid common pitfalls that damage a brand’s reputation. By establishing an effective content strategy, brands will generate content that gets their community engaged and keeps them returning to the brand’s web properties time and time again. A successfully implemented social media strategy will turn a brand’s community members into brand evangelists who, by default, sell the brand’s products or services to their friends and family. Going Local on Facebook in 2013 – What’s Nearby? This article first appeared in Websites Magazines January 2, 2012 issue. Due to mobile’s rising popularity and use, expect localization to be among the top trends of 2013. That said, many consumers leverage social networks on their mobile devices, which means that appearing in the local search results on networks like Facebook will be more important than ever for businesses of all sizes. This is why it is vital for brands to maintain a presence on social networks to not only communicate with customers, but also to be found. This article first appeared in AdAge’s online edition. Over the past year, a hard, cold fact has sunk in for brands about Facebook: If you want to reach your fans, increasingly you have to pay for it. That’s a growing concern for agencies doing business with Facebook, so now one of the very biggest, WPP media-buying unit Group M, is investigating the matter. 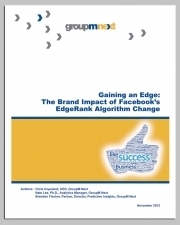 Research conducted by Group M Next (a unit devoted to sourcing new technologies) into pages operated by 25 brands finds that the share of Facebook users seeing organic posts from a brand they “like” was down 38% in the five weeks after Sept. 20, from 15.56% (consistent with the average 16% Facebook has often reported) to 9.62%. While those findings won’t be heartening to brands, researchers found a silver lining: engagement on posts in the form of comments, likes and shares is up significantly, from 0.76% before the algorithm change to 1.49% after. That’s nearly identical to the results of aEhrenberg-Bass Institute study of 200 top brand pages earlier this month. The result is that while fewer fans are seeing organic posts in their news feeds, those who do are more likely to have a real affinity for the brand, as opposed to users who may have clicked on the “like” button to enter a contest. The bottom line is that many brands will have to ante up more ad dollars to maintain the reach among fans they were accustomed to. But the study also digs into the change in newsfeed reach by post type to give brands insight into what content performs best in the new environment. It finds that links took the biggest hit from algorithmic changes and were being seen by 68.19% fewer fans after Sept. 20, but text status updates started getting viewed by 19.48% more. The conclusion is that brands that change up the mix of their posts to rely less on the ones that saw the biggest drops in exposure can maintain their newsfeed reach at above 12% and thus use “paid advertising as a supplement, rather than a full replacement,” according to the paper. Group M Next didn’t provide a list of brands in the study but says they represent a cross section of categories and have Facebook fan bases in the multiple millions at the upper end. Group M agencies MindShare, Maxus, Mediacom and MEC boast clients like Unilever, IBM and Volkswagen. 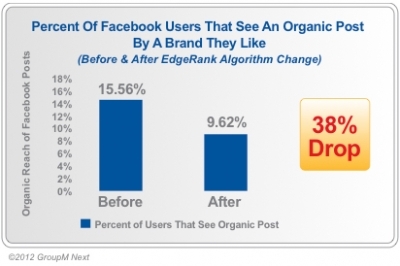 The findings are at odds with Facebook’s continued rebuttal of the contention that organic posts are reaching a smaller portion of fans. (The related inference it most objects to is that the change was made to encourage use of its ad product “promoted posts” to offset the lost reach.) Facebook contends that algorithmic changes were made to weed out spammy, non-engaging content, but that median reach of pages hasn’t changed. 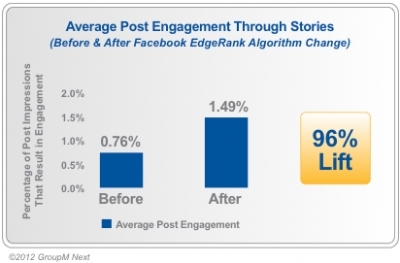 But if the higher post engagement Group M Next observed is true across a wide spectrum of pages, the case can also be made that Facebook’s news-feed algorithm changes are a net positive for brands. Group M agency Mediacom’s client Pennzoil has observed both reported phenomena of diminished newsfeed reach and increased post engagement over the past two months, but Global Associate Brand Manager Suzanne Clerkin says her team doesn’t intend to increase Facebook ad spend as a result. She says the increase in post engagement is a desirable outcome. “We understand that not everyone who likes our page will able to see every post we monitor, but we’re hoping that Facebook will help us continue to monitor the fans who appreciate us the most,” she said.